The idea of oiling your hair twice a week seems old school, right? Wrong! Turns out, your mom was right to slather oil on your hair regularly. Oiling is the best way to pamper your hair. It gives your hair the essential nutrients and proteins it needs to become stronger and shinier. One of the best ways to get healthy, long, and thick hair is to sit back and enjoy a nice hot oil massage. A good hair oil with high-quality ingredients promotes healthy hair growth, relieves your scalp of bacterial infections, and prevents premature graying of hair. 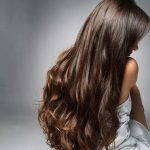 In this article, I have compiled a list of the 15 best hair growth oils available in India. But first, let’s talk about what you should be looking for in a hair growth oil. This one’s obvious. Any good hair growth oil will nourish your follicles and create the right scalp environment for maximized hair growth. A good hair oil will not only boost hair growth but also stimulate the dormant follicles on your scalp to produce new hair strands. 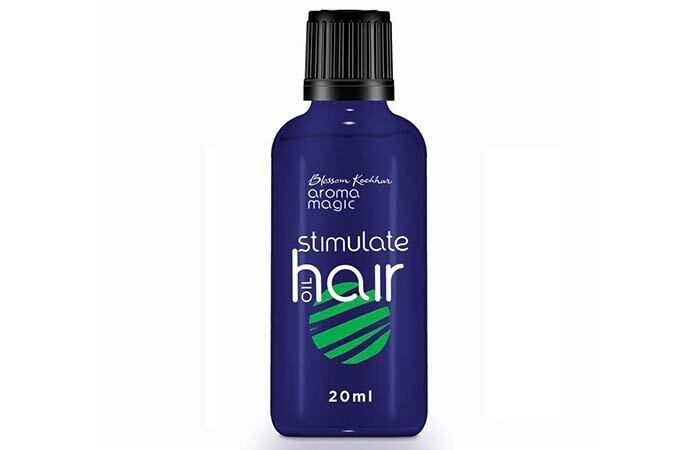 This quality helps improve hair volume and thickness. A lot of factors can lead to hair loss. A good hair growth oil will be able to curb the issue at its root (pun intended!) by ensuring that your scalp and follicles are in top shape. Only a nourished follicle can produce healthy hair, and your hair needs constant nourishment to remain healthy. Your hair needs optimum hydration to keep damage at bay. This is because dry hair is more susceptible to damage than conditioned hair. Dryness can lead to issues like split ends, breakage, frizz, and awful hair texture. Now that you know how to pick out a good hair growth oil, let’s check out the best ones available on the market. What’s better than a brand that combines modern science with Ayurveda? This combination can give you the kind of hair you’ve always dreamt of! 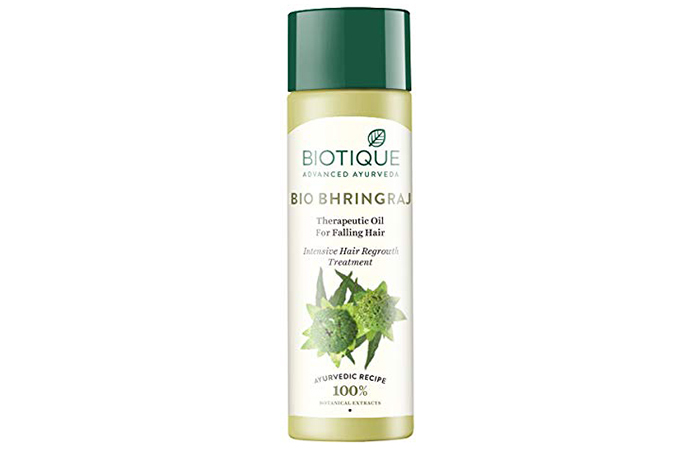 Biotique Bio Bhringraj Therapeutic Oil is formulated with a blend of potent herbs like pure bhringraj, tesu, amla, mulethi, coconut oil, and goat milk. These ingredients help treat alopecia and other scalp and hair concerns to give you clean, fresh, healthy, and gorgeous-looking hair. It improves the texture of your hair, nourishes your scalp, strengthens each hair strand, promotes new hair growth, and prevents graying. The best thing about this oil is that it makes your hair visibly silkier in just one use. 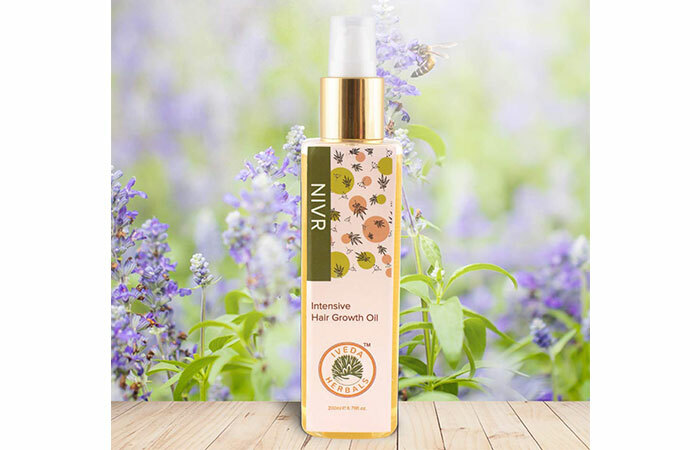 Nivr Intensive Hair Growth Oil is the ideal solution to tackle hair damage, hair breakage, and scalp dryness, along with many other hair issues. Pollution, digital exposure, urban lifestyles, lack of proper diet, and UV rays are the most common hair damaging issues that this hair oil seeks to fight. It contains 6 herbs that nourish your scalp: Neeli, Amla, Bhringraj, Aloe Vera, Mint Oil, and Jojoba Oil. These herbs help heal and repair the damaged cells in your scalp and improve follicle health to give you faster hair growth. What makes this hair oil more reliable is that it is certified by the ministry of Ayush, Govt. of India. An array of unique ingredients make up the glorious formula of Khadi Natural Henna & Rosemary Herbal Hair Oil that promises to give you long, thick, and healthy hair. This luxurious hair growth oil contains rosemary and henna that treat inflammation and soothe your scalp. It enhances new hair growth, restores your natural hair color, and imparts brilliant shine to dull hair. This oil prevents hair loss and promotes hair growth even on balding scalps. It also makes your hair soft, silky, lustrous, and more manageable. It acts as an antioxidant and kills bacteria to give you a healthy and clean scalp. This nourishing oil adds volume and improves the texture of thinning hair. Kesh King Ayurvedic Medicinal Oil is prepared according to the principles laid in Ayurvedic texts like Charaka Samhita, Panchakarma, and Siddha Medicine. It deals with a myriad of hair concerns like hair fall, dandruff, and dryness. 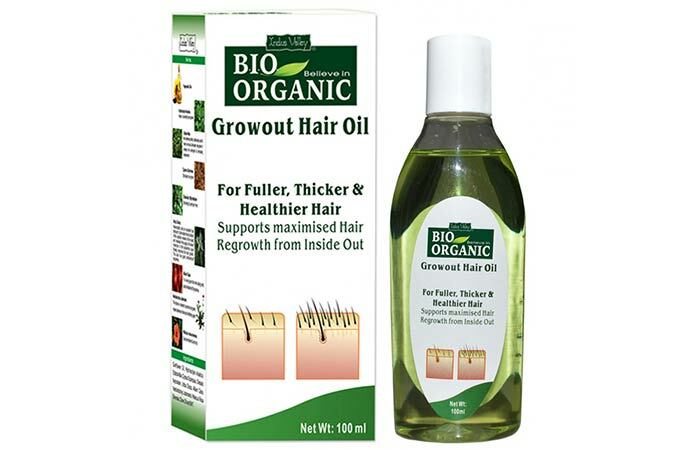 This oil is prepared using the Tel Pak Vidhi method, a process where a number of herbs are cooked in a blend of hair growth carrier oils like castor, coconut, and sesame oils. This oil, in particular, is prepared with 21 precious herbs cooked in sesame oil. This 100% Ayurvedic formula helps in the regrowth of hair and stimulates your roots to give you thick, strong, and healthy hair. Its ingredients like brahmi and bhringraj also help in treating headache and sleeplessness. This soothing yet powerful hair oil is a holy grail for those suffering from dry and limp hair. It moisturizes your scalp to promote healthy and strong hair growth. Its light and non-sticky formula does not weigh your hair down. 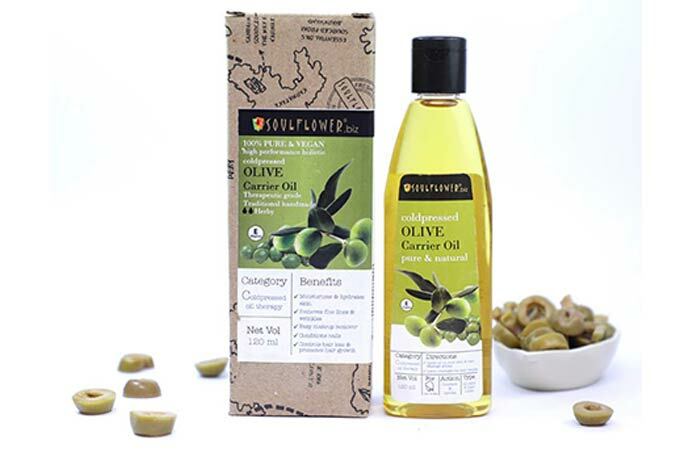 This 100% virgin olive oil is prepared using the no-heat method to retain its therapeutic and healing properties without any side effects. It features a blend of vitamins E, K, and D3 that moisturizes even the driest parts of your hair. The rejuvenating effects of olive oil strengthen your hair while keeping your strands healthy and damage-free. The best thing about this oil is that it cures hair loss and revitalizes each hair strand to prevent split ends. 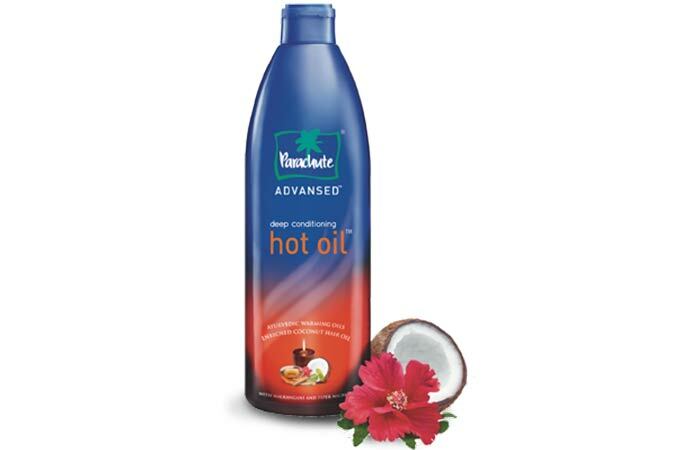 To keep your hair from drying out during the winter, Parachute formulated this Ayutvedic Deep Conditioning Hot Oil. It reduces dryness and nourishes damaged hair and makes it soft, silky, and healthy. It contains rare deep conditioning herbs like white thyme, black pepper, hibiscus, and malkangani extracts. White thyme, in particular, helps in hair growth by the blood circulation in your scalp. This vitamin-rich oil contains flavonoids that have exceptional growth-stimulating and anti-dandruff properties. It also strengthens your hair, combats hair loss, and reduces itchiness on the scalp. Want healthier and fuller-looking hair within weeks? Try Indus Valley Bio Organic Grow Out Hair Oil that is made from premium herbs, natural extracts, and essential oils like centella, nettle, bulb onion, false daisy, and clove oil. These ingredients work exceptionally well in promoting new hair growth and strengthening the hair cuticles. This innovative oil is designed for multipurpose uses like preventing hair loss, dandruff, breakage, and split ends. This oil enhances micro-circulation in the hair follicles to promote healthy hair growth. It provides vital nutrients to your scalp and roots while restoring your hair’s natural balance. It increases the production of tyrosinase, which helps in the re-pigmentation of discolored hair. Needs to be tested for allergic reactions before use. 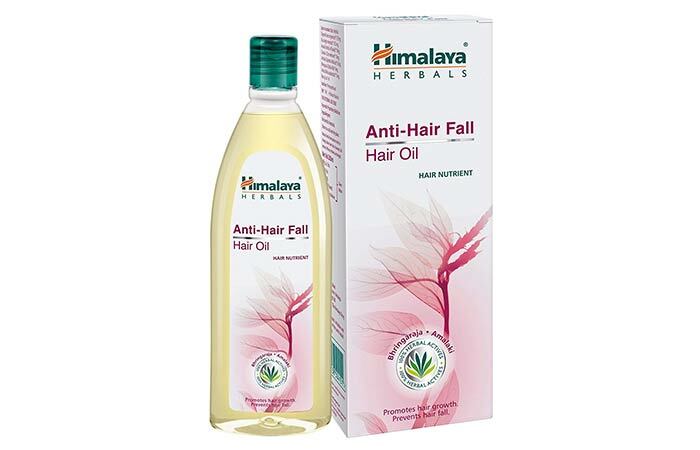 Himalaya’s Anti-Hair Fall Hair Oil is designed exclusively for dry, damaged, and falling hair. This lightweight formula is enriched with the goodness of bhringraj and amalaki that strengthen your roots to promote healthy hair growth. It contains phytochemicals that are effective in treating hair loss and various other scalp conditions. This protein-rich hair oil treats balding spots and rebuilds the strength and vitality of limp and fragile hair strands. The natural extracts in this oil relieve the dryness and itchiness on your scalp without causing any side effects. Are you looking for a multipurpose oil that can curb all your hair concerns? Here’s a product that might interest you! 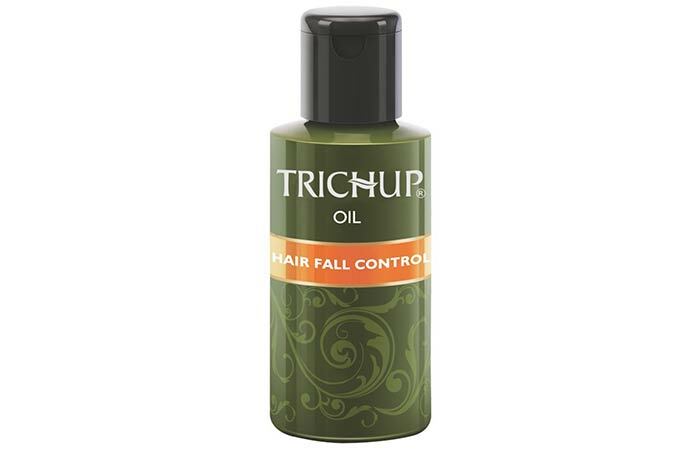 Trichup Hair Fall Control Oil is made of nature’s finest herbs and Ayurvedic plants that help in promoting hair growth and revitalizing hair follicles from root to tip. It imparts essential nutrients to your roots through ingredients like bhringraj, amalaki, neem, and gunja blended into sesame and coconut oils. These natural ingredients reduce hair fall and hair breakage. It strengthens your hair from the roots to give it a natural bounce. This herbal oil nourishes each hair strand from within to give you healthy, soft, silky, and flowing hair. With regular use, this herbal oil is guaranteed to improve the overall health of your hair and scalp. This herbal blend is created specially to treat an unhealthy scalp. It contains an active protein complex that penetrates deep into your scalp to nourish it. It increases the multiplication of cells, thus promoting rapid hair growth. It imparts vitality to each strand to return it to the normal growth cycle. It also improves the texture of your hair and adds shine to it. The rich essential ingredients in this oil replenish lost proteins to give you healthy, silky and thick hair. It claims to restore the health of your hair and scalp healthy in just 30 days. As its name suggests, Aroma Magic Stimulate Hair Oil truly works like magic to give you gorgeous hair. 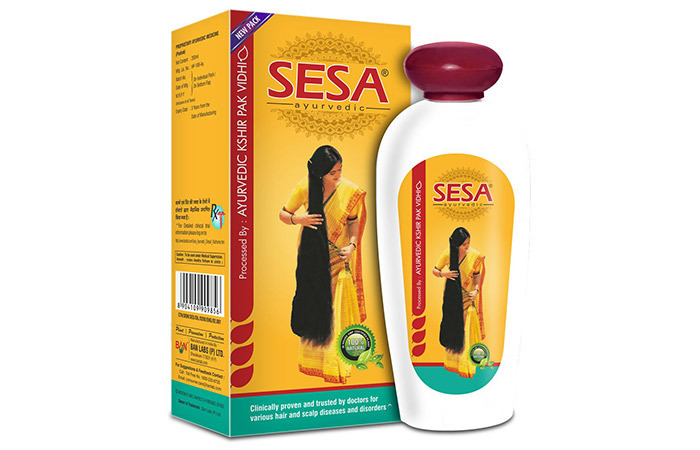 Its rich formula stimulates your roots and increases the blood circulation in your scalp to prevent hair loss. 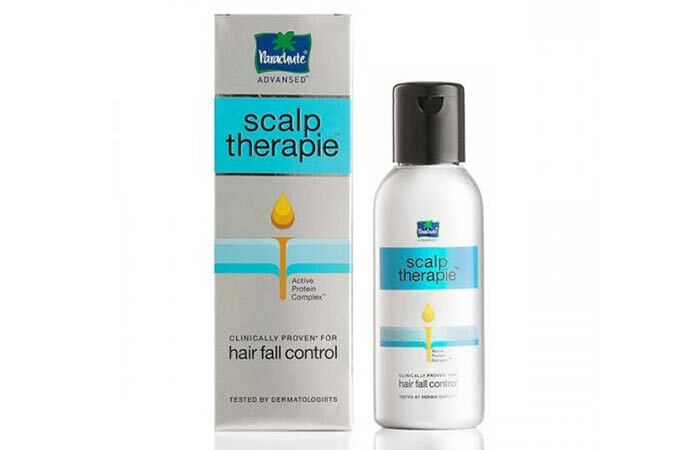 When applied, it creates a cooling sensation on your scalp that is very calming. It treats inflammation and scalp infection. It strengthens your hair follicles from within and increases your hair’s elasticity. This light and non-sticky formula claims to cover grays and retain your natural hair color. This colorless hair oil needs to be diluted with water or another carrier oil because of its thick consistency. 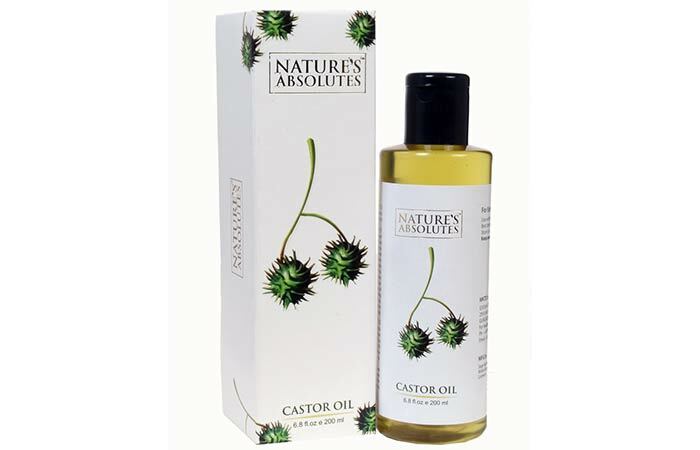 Nature’s Absolutes Castor Oil is made from organically grown castor seeds from Rajasthan. This oil is extracted using the traditional cold pressing method to avoid compromising on its quality. It nourishes dry and flaky scalp and regulates the secretion of natural oils. Castor oil is rich in nutrients and vitamins that help strengthen weak and brittle hair. It promotes healthy hair growth and prevents premature balding. It revitalizes dry strands and repairs split ends. It also soothes an irritated scalp and prevents dandruff. This gentle and lightweight hair oil adds a radiant glow to your locks, making them more healthy and manageable. 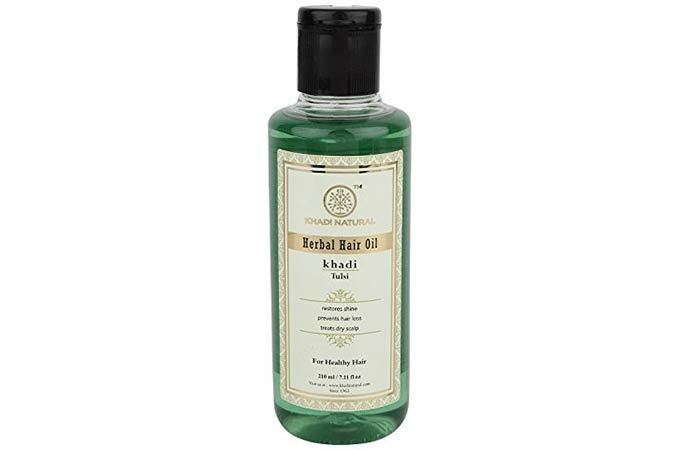 Khadi Natural Tulsi Herbal Hair Oil contains a blend of rich ingredients like tulsi, amla, camphor, neem, shikakai, and sesame oil that encourage new hair growth and prevent hair loss. It eliminates scalp infections and reduces itching, dandruff, and psoriasis. It also prevents premature graying and leaves your hair looking naturally black. This enriching oil soothes your scalp and increases the blood flow to it to trigger the growth process. This light and non-sticky formula does not weigh your hair down. When applied, it creates a tingling feeling on your scalp, which is helpful in treating stress and insomnia. It contains vitamins and nutrients that help improve the overall health of your hair. 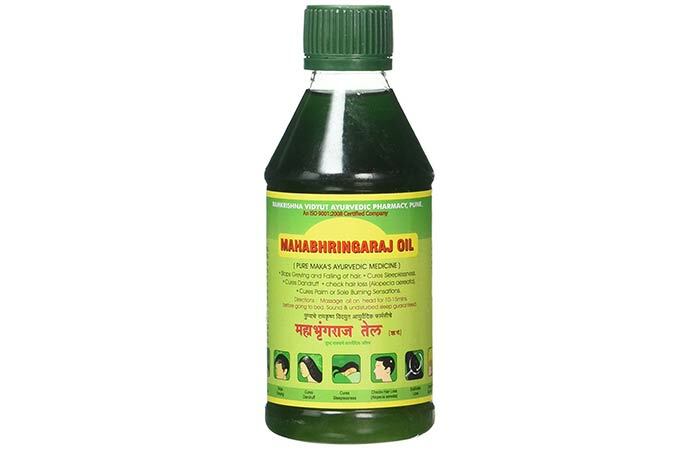 Mahabhringraj Ayurvedic Medicinal Oil contains self-cultivated, organic, farm-fresh ingredients that nourish your hair. It tackles hair problems like dandruff, alopecia areata, and scalp redness. It contains maka, bharmi, amla, hirda, nagarmotha, dried rose petals, and six other rare herbs. These ingredients rejuvenate dry strands and improve the texture of your hair. It also contains kapurkanchani that kill bacteria and lice. Jatamansi is another rare herb that aids in the prevention of hair fall. The strong and alluring fragrance of this oil treats headache and insomnia. It soothes your scalp and treats inflammation. The best thing about this oil is that it repairs split ends and hair damage almost immediately. 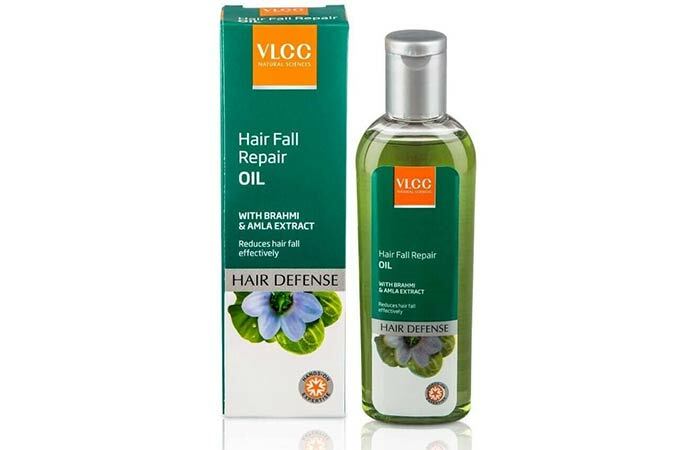 VLCC Hair Defense Hair Fall Repair Oil contains amla and brahmi extracts that promote healthy hair growth and prevent premature graying of hair. It nourishes your hair follicles and improves blood circulation in your scalp. This oil imparts nutrients to your roots to give you healthy, silky, and shiny hair. It repairs damaged cuticles and improves the texture of your hair. It also prevents hair fall, reduces dandruff, controls damage, and adds shine to your hair. 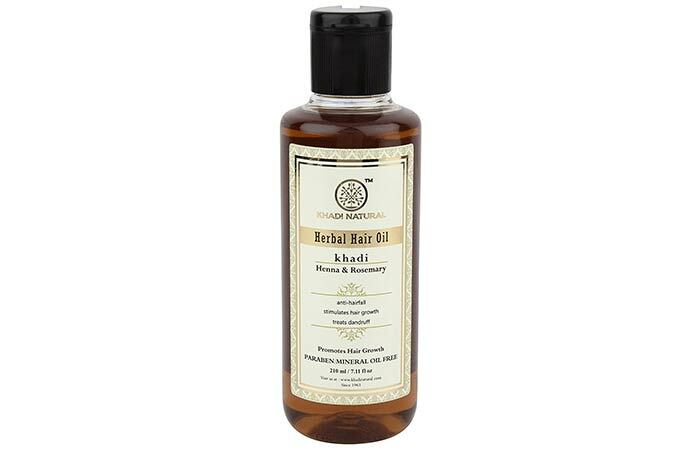 This Ayurvedic hair growth oil is created using the traditional ‘Pak Vidhi’ method, where 18 nourishing herbs and 5 revitalizing oils are processed in milk. This herbal mix nourishes your hair from roots to tips and improves blood circulation in the follicles. The herbs present in this oil work wonders in controlling hair fall. The oilt stimulates growth and claims to give you thicker and healthier hair in just two weeks. Buying the right hair growth oil is not enough. You also need to apply it correctly to get the best results. So, let’s check out the right way to oil your hair. What Is The Right Way To Oil Your Hair? Brush your hair thoroughly to get rid of tangles and knots. This will helps make the application process easy. Part your hair down the middle and divide it into two sections. Take a spoonful of oil on your palm and rub your palms together. Slowly massage the oil into your scalp with your fingertips in a circular motion. After you’ve applied oil to all your hair, leave it on for 30 minutes. Comb your hair from root to tip to spread the oil evenly. You can even leave the oil on overnight, but make sure you wash your hair within 24 hours. Oiling is a vital part of any hair care routine, especially if you are trying to grow out your hair. Keep in mind that everyone’s hair is different, and it might take you a few tries to find the perfect hair oil. Have you tried any of these hair oils? Let us know about your experience in the comments section below. The hair growth process is all about patience. Ensuring that your hair is getting all the nourishment it needs is crucial, and this is when biotin comes into the picture.